The key to making them is to keep your heat low or they may burn quickly. It is very easy to prepare, and even tastier to eat! I love salt and vinegar potato chips, so I placed my own personal twist and added salt and vinegar for a very tasty zip! Pre-heat oven to 300 degrees (I used a toaster oven to save energy). Get a bag of pre-chopped kale greens. This will cut down on your prep time because most of the stems will already be removed. Remove the stems and large veins from the leaves, leaving only the leafy part of the greens. 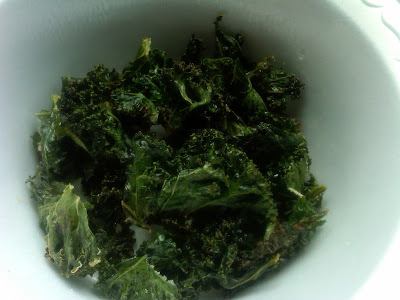 Place the kale on the baking sheet and make sure the leaves do not overlap or touch each other. Baked for about 10 minutes until the ends are crisp, but not burned. The greens should STAY GREEN, so once they start getting dark green, pull them out and touch the edges to see if they are crisp. Once you have pulled them out, drizzle a little bit of vinegar and sprinkle sea salt and enjoy! Only drizzle the salt and vinegar on the batch you intend to eat immediately. Letting the vinegar sit too long causes them to get soggy.